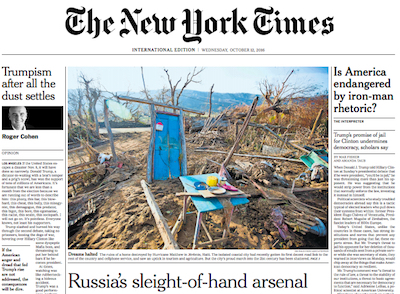 Yesterday's edition of the International New York Times was the final issue published under that title: today, it was relaunched as the International Edition of The New York Times. 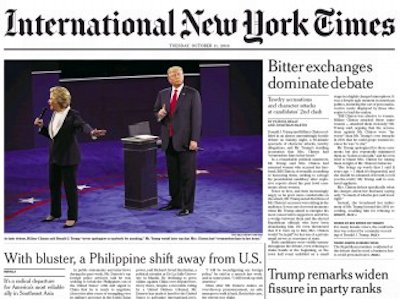 The rebranding (which was not announced in advance) comes almost exactly three years after the International New York Times replaced the International Herald Tribune. The newspaper has also been redesigned, with a focus on "deep reporting and analysis", according to a letter by publisher Arthur Sulzberger. There are no news-in-brief items, the sport section has been shortened, the opinion and editorial section has been expanded (including a new front-page opinion column), and four pages have been added. In summary, the paper feels more like its weekend edition.